Republican presidential candidate Senator John McCain makes a campaign stop at Union Station in Kansas City, Mo. John McCain might seem like a long shot. He's the presumptive Republican nominee at a time when the two-term Republican President is wildly unpopular and Republicans are losing elections in perennially Republican districts and the party base isn't exactly drooling over him. He supported the President's unpopular efforts to transform Iraq and revamp Social Security; he was against the Bush tax cuts before he was for them. He's a 71-year-old Washington hand in a change election. And his 46-year-old opponent is a lot better at raising money, delivering speeches, drawing crowds and registering new voters. Last week, the McCain campaign's case against Barack Obama went something like this: He's irresponsible when it comes to Iraq, naive when it comes to Iran and a Big Government liberal when it comes to the economy. But now Iraqi Prime Minister Nouri al-Maliki has more or less endorsed Obama's plan to withdraw from Iraq, forcing McCain to argue that al-Maliki didn't really mean it, and even the Bush Administration has accepted a "time horizon" for withdrawal, if not a precise "timetable." The Bush Administration has also engaged in some diplomatic outreach with Iran, just as Obama has recommended, a severe blow to McCain's efforts to portray Obama's willingness to engage in dialogue as appeasement. And on the economy, a TIME/Rockefeller Foundation poll found that 82% of the country supports more federal infrastructure spending designed to create jobs. When Big Government liberalism is all the rage, McCain's courage in opposing water projects or the farm bill becomes less of a selling point. McCain has struggled to find his voice in this environment. His initial reaction to the foreclosure crisis boiled down to old-fashioned conservative self-reliance, which went over like a lead balloon, and was eventually replaced with a more aggressive plan for government assistance. He has changed or shaded his positions on offshore drilling, the estate tax, ethanol, immigration and a host of other issues. He can't seem to decide whether to run as a maverick and risk demoralizing a GOP base that already mistrusts him or run as a conservative and risk alienating swing voters who already miss the John McCain of 2000. And his campaign  which survived a near-death experience in the primaries  is in seemingly perpetual turmoil. But McCain is still a compelling figure, and shake-ups happen. His real problem is the political environment. He's a Republican in what is emerging as a Democratic year. And he's aligned with Bush in a year of Bush fatigue over the Bush economy. Emory University's Alan Abramowitz has concocted a formula that has predicted the popular vote winner in 14 of the last 15 elections; it missed in 1968 but got the razor-thin margin right. His barometer uses three criteria: the approval rating of the incumbent President, the economic growth rate and the "time-for-a-change" factor of whether the incumbent's party has controlled the White House for two terms. McCain's score is the worst since Jimmy Carter's in 1980. 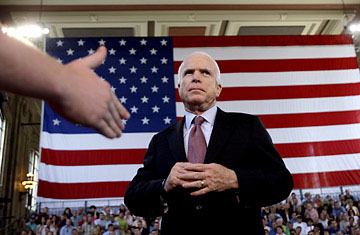 "History suggests that McCain is toast," Clive Crook wrote in the Financial Times. Then again, history also suggests that Democrats don't blow out Republicans; there hasn't been a Democratic landslide since Lyndon Johnson in 1964. It's also unwise to underestimate the hunger of the media for an exciting race. If Obama emerges as a big front runner, it's a good bet that the press will air more of McCain's attacks. And so far, polls have indicated a fairly tight race, usually tilting toward Obama by just a few points. Obama is still a relative newcomer in a wartime election, unknown to many Americans. He's still got his Rev. Wright problem. And during the primaries, even a sizable number of Democrats told pollsters they felt uncomfortable voting for a black man. But Obama is getting to look like a leader this week, comparing withdrawal plans with al-Maliki, welcoming the Bush Administration to the it's-O.K.-to-negotiate-with-Iran club, making McCain look like an isolated warmonger. It was one thing when McCain was framing the election as a monumental decision of victory vs. surrender; time horizon vs. timetable is going to be a tougher sell. Meanwhile, Obama's campaign has been signing up thousands of new Democratic voters and shoveling in cash it can use to introduce him to America. He could still foul up the debates or make a monumental gaffe or otherwise misplay his strong hand. It's still possible that something could happen  Fidel Castro's death? A Democratic scandal?  to shake up the dynamics of the race. In politics, anything's possible. That doesn't mean that anything's probable. The media will try to preserve the illusion of a toss-up; you'll keep seeing "Obama Leads, But Voters Have Concerns" headlines. But when Democrats are winning blood-red congressional districts in Mississippi and Louisiana, when the Republican President is down to 28% approval ratings, when the economy is tanking and world affairs keep breaking Obama's way, it shouldn't be heresy to recognize that McCain needs an improbable series of breaks. Analysts get paid to analyze and cable news has airtime to fill, so pundits have an incentive to make politics seem complicated. In the end, though, it's usually pretty simple. Everyone seems to agree that 2008 is a change election. Which of these guys looks like change?